Beautifully illustrated. 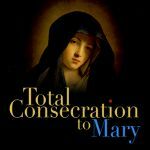 The Novena to the Immaculate Conception is composed of traditional prayers of the Church and of the saints. In honor of the 150th anniversary of the definition of the Dogma. Followed by The Stations of the Infant Jesus, or The Way of Bethlehem by the incomparable Saint Alphonsus. Ends with The Burning Babe, the poignant poem of Saint Robert Southwell, S. J., one of the great martyrs of the English Reformation. Softcover, 32 pages. 42 pictures in color.